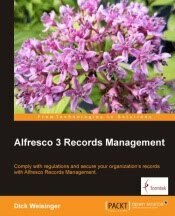 About a month has passed since the Alfresco Enterprise 3.2r release. The Alfresco development team is now in heads-down development, working on release 3.3. The roadmap for the 3.3 release is posted on the Alfresco wiki and the next upcoming release, version 3.3, is scheduled for Q2 2010. Out of curiosity, I thought that I'd check in with the latest Alfresco SVN HEAD source code to see some of the things that are brewing for the 3.3 release. There are at least three areas that are showing interesting development, and I'll mention them here. I did run across some problems, but then this code is far from a release date of a few months from now. 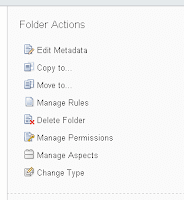 Now when looking at the Actions available for a Folder/Space within Share, you see the following options. Here I compare how the Folder Actions options have changed. 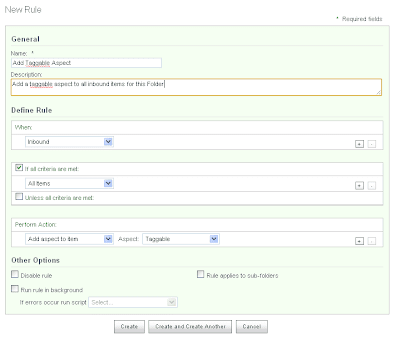 On click of "Create Rule" you get a single screen for defining the new rule. 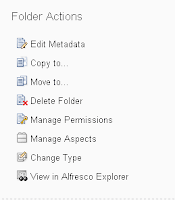 Unlike the wizard of Alfresco explorer, it's all in one place. The "Link to Rule Set" will let you define libraries of reusable rules. I think I prefer this consolidated view to defining a rule compared to the explorer wizard interface. And it looks like a lot of the new rules functionality for Share is already working. As shown above, I tried creating a rule on a space that adds the Taggable Aspect to incoming items to the folder. Most of the UI is working pretty well. The rule itself though didn't seem to get run when I later added content to the folder, and subsequent clicks on "Manage Rules" for the folder threw some errors. I also experimented by creating a rule that would assign a simple workflow to incoming items of the folder. I selected the Review and Approve Workflow with the option of moving the document to a different folder after approval. I liked the interface for specifying the workflow, but this threw an error too. It was interesting, although maybe not unexpected, that the error was one that shows the Surf logo. That's the first time I've seen that in Share. Alfresco's Ben Hagan has written a Blog entry explaining how to build and test the new Alfresco Web Editor (AWE). This is the Web Editor that will be used in future releases of Alfresco WCM. It all worked for me as described in Ben's blog, and it looks like it has good potential. It looks a bit early though to start building anything out with it just yet. But to already have something up and running is a good sign that there will probably be rapid progress on this front.